The runway is loaded with beautiful, extravagant creations, but often the details get lost in the spectacle as models float by in one look after another. Thankfully, Vogue Runway dug deep and found out down to the number of hours and hand-applied crystals it took to create some of the year’s most magical looks. From 500,000 sequins and 20,000 flowers to 20 artisans working 1,200 hours, here are some of the most arduous creations in fashion from 2016. A sea goddess emerging from a shipwreck was what designer Sarah Burton had in mind when designing this ethereal dress, which features 500,000 hand-embroidered sequins on a silk tulle base. The frills at the bottom of the dress, evoking crashing waves, consist of 65 meters of silk tulle. 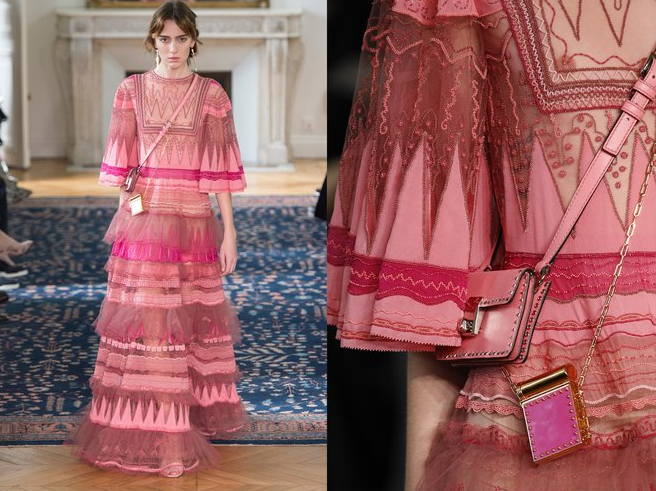 It seems like almost every shade of pink imaginable was used in this dress by Pierpaolo Piccioli for his first collection for Valentino. Inspired by 1970s Zandra Rhodes caftans, twenty people spent 2,000 hours to hand-embroider 20,000 tiny beads of cocceto (opaque colored beads) and georgette applications in two different colors (“paradise rose” and “old rose”), plus chiffon in two other colors (“old rose” and “fuchsia”). 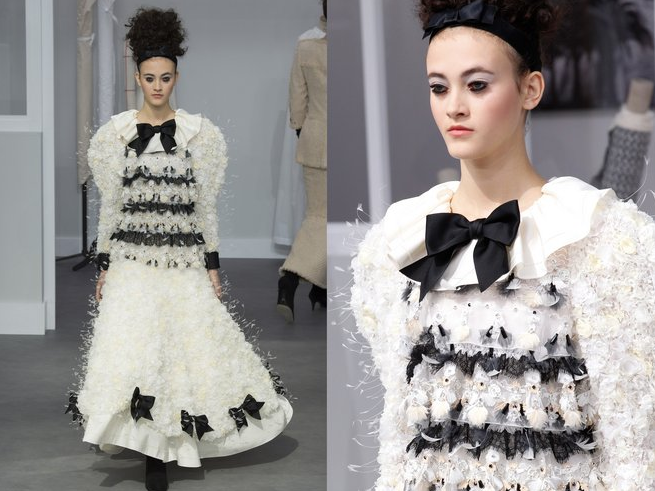 It took 20,000 flowers and 1,250 rhinestones, in addition to lace inserts embellished with leather flowers and miniature feathers with a bottom hem hand-embellished with 10 over-the-top satin bows to create this stunning look for Chanel’s fall ’16 couture. Gucci took 34 days to create this frothy dress with two special types of embroidery: Zardosi, a small needle technique, and Aari, a long-needle technique, using glass stones, beads, Lurex cords, and jewel-like embellishments. 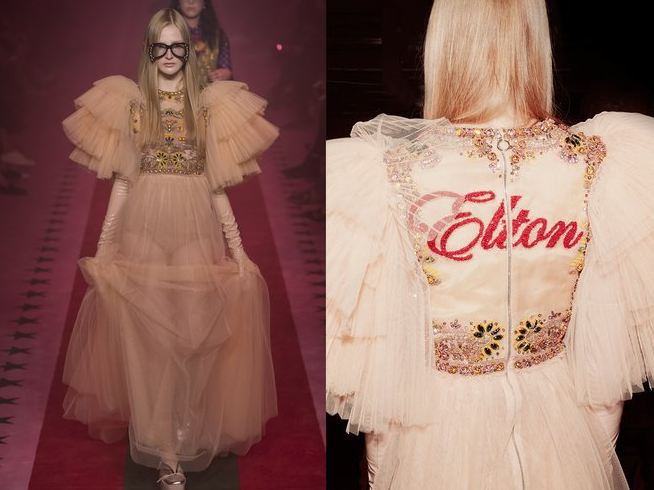 On the back, it took four days to painstakingly apply red Swarovski crystals, Lurex thread and glass beads to spell out Elton. In order to create the swirling optical illusion on this dress, 20 embroiderers, seamstresses, and designers used a mix of Italian thread and Miyuki Japanese glass micro tubes on a base of invisible tulle. Ribbons of Italian organza were then dyed in dégradé from pale blue to pastel pink and arranged in a wavelike pattern. The total look took about 1,200 hours to create and weighs over six pounds.